The perfect holiday ham for this year's feast! 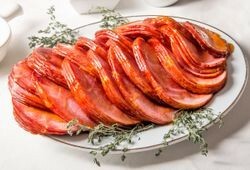 Our boneless, fully cooked and pre-sliced holiday ham is hickory smoked and slow-cooked with a honey glaze to produce a rich, delectable flavor that could satisfy any guest. Your guests will fall in love at first bite! Garnish with canned pineapples or cherries for additional flavor! Ham Instructions: Thaw completely in refrigerator. Preheat oven to 350°F. Remove Ham from plastic bag and place in a shallow pan. Do not cover. Heat for approximately 1 hour. Remove from the oven and let rest for 15 minutes. Glaze if desired. Times may vary by oven, adjust time if needed. Glaze Instructions: Turn oven to low broil. Microwave honey glaze for 30 seconds until glaze becomes thin and runny. CAUTION: Glaze will be very hot! Brush glaze over ham. Place back in the oven for 5 minutes and watch closely. Remove from oven, apply more glaze and return to oven. Continue process until desired color and glaze coating is achieved. Cherries or canned Pineapples may be used for an additional garnish. My family and I ate the Ham last night. The taste was excellent with or without the glaze.There was enough for at least a dozen people and then some. The slices were so evenly pre-cut and would be great for a party and don't forget Super Bowl.